Meets ASTM F1677-96 MARK II non-slip testing standards. Meets ASTM F2913 SATRA non-slip testing standards. Meets ASTM F2412-11 and F2413-11 M I/75 C/75 EH standards. 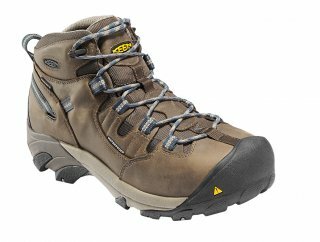 Crafted with the KEEN.DRY waterproof, breathable membrane and a flexible, supportive fit, these steel toe work boots help you get the job done. With a hiking-inspired silhouette and reflective safety features, they look as good as they feel.